The celebration of 50 years of Ford Mustang will be so large Ford Motor Company and the Mustang Club of America plan to simultaneously hold it at two locations from April 16 through April 20, 2014. Open to everyone, not just Mustang owners and MCA members, the event will be held at Charlotte Motor Speedway in Concord, N.C. and at Las Vegas Motor Speedway in Las Vegas. �Working closely with Ford, we want to make the official Mustang 50-Year celebration the most important car event of 2014,� said Ronald D. Bramlett, Mustang Club of America executive director of the Mustang 50th Birthday Celebration. �We hope everyone who loves this iconic car will join us to share their personal Mustang story. Charlotte Motor Speedway and Las Vegas Motor Speedway, two of the most prestigious racetracks in the United States, are positioned to allow the maximum number of enthusiasts worldwide to attend the Mustang 50th Birthday Celebration. MCA will also organize �Pony Drives� so Mustang owners can travel in an organized group to each venue. �Mustang enthusiasts are among the most passionate fans in the world,� said Steven Ling, Ford car marketing manager. �These twin events are really for them. 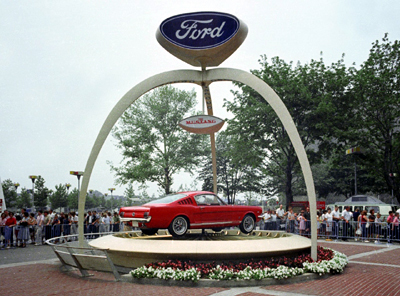 We�re proud to be part of this celebration of a car that�s often called the soul of Ford Motor Company. The original American pony car has been extremely successful for Ford, with more than 9 million sold throughout its lifetime. A key aspect to its success is that the car has always been offered in a variety of configurations, appealing to a wide variety of people. Since the Ford Mustang was launched at the 1964 World�s Fair in New York, it has become an important part of pop culture. Mustang has more than 3,000 appearances in film and television, plus hundreds of musical references. With nearly 5.5 million fans, Mustang is the world�s most popular automotive nameplate on Facebook. Always evolving, each new model year of Ford Mustang has been embraced over the decades, offerings people a way to express themselves. Mustang has been a canvas for personalization. From 600-horsepower-plus versions that can exceed 200 mph to the most affordable models that get more than 30 mpg and deliver more than 300 horsepower, Mustang�s universal appeal has made it a symbol of Americana.